Balzer + Bray, 9780062342331, 240pp. A hilarious and spunky new heroine in the vein of the heroines of such beloved books as Ramona the Pest, Ivy and Bean, and Clementine, from Crystal Allen—the acclaimed author of How Lamar’s Bad Prank Won a Bubba-Sized Trophy. Nine-year-old Mya Tibbs is boot-scootin’ excited for the best week of the whole school year—SPIRIT WEEK! 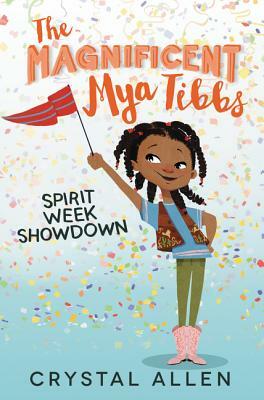 She and her megapopular best friend, Naomi Jackson, even made a pinky promise to be Spirit Week partners so they can win the big prize: special VIP tickets to the Fall Festival! But when the partner picking goes horribly wrong, Mya gets paired with Mean Connie Tate—the biggest bully in school. And she can’t get out of it. Now Naomi is friend-ending mad at Mya for breaking a promise—even though Mya couldn’t help it—and everyone at school is calling Mya names. Can Mya work with Mean Connie to win the VIP tickets and get her best friend back?